Cardinals rookie David Johnson scored two touchdowns on his first three NFL touches. It didn’t take long for the Cardinals to get on the scoreboard Sunday against the Bears in Chicago. 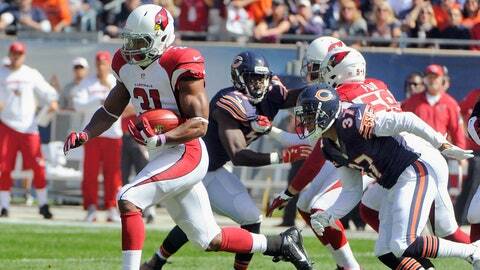 Rookie David Johnson fielded the opening kickoff and weaved his way 108 yards to the end zone. In Week 1, the rookie third-round pick turned his lone reception into a 55-yard touchdown and returned one kickoff 43 yards. The Cardinals have clearly found themselves a playmaker in the backfield.